At Orchard Ridge, porches do more than add curb appeal – it’s part of the lifestyle. They extend your living space outdoors, putting you that much closer to nature and creating a space for family and friends to gather. Here are just a few tips and ideas to help you take advantage of this often-underutilized space and transform it into your new favorite place. Your front porch is valuable living space that should be used to its full advantage. 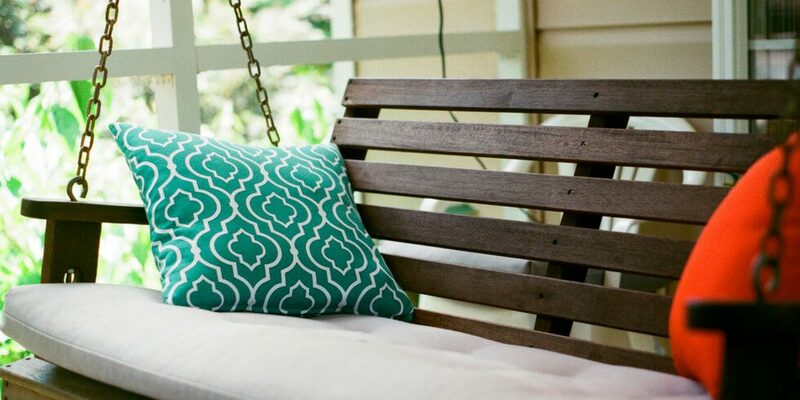 Hang up a porch swing or hammock for a comfortable place to curl up with a good book. A rocking chair is another seating option that’s ideal for sipping tea and chatting with the neighbors as they stroll by. A small table and chairs create a useful space to get some work done while enjoying the fresh air, or for a romantic dinner alfresco with your significant other. But every family is different, so make sure to use the space for what you really need. Add some hooks for dripping raincoats, a tray by the door so dirty shoes stay outside or even some stylish shelves and boxes to store your gardening tools and gloves. The local Liberty Hill Winkley’s hardware store, located just down the road from Orchard Ridge, is the perfect one-stop shop for everything you’ll need. Add personal touches and make the space unique to your tastes and interests. Add some throw pillows in your favorite color or pattern, hang up twinkling lights, include some funky house numbers or go crazy decorating for the holidays. Don’t forget about the floor – you can stain a cement porch an exciting color, opt for a wood porch for a more rustic feel or even toss down a durable hemp rug to add some texture and interest. You can even expand your garden beyond your resident bed in Orchard Ridge’s Community Gardens and show off your favorite flowers, vines and succulents, or keep a container garden of herbs nearby for fresh and flavorful meals. For even more ideas to get your creative juices flowing, take a look at our Front Porch Living Pinterest board. Orchard Ridge’s home builders – Dream Finders Homes, Buffington Homes, Lennar and Pacesetter Homes – know exactly what today’s homebuyers are looking for, from classic front porches to innovative home automation. To learn more about the homes and lifestyle at Orchard Ridge, join our Interest List.